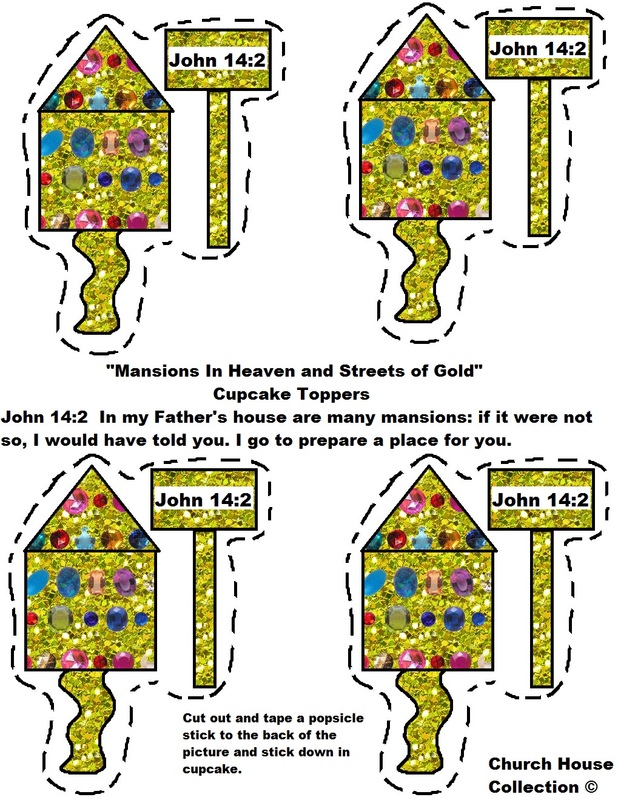 John 14:2-In my Father's house are many mansions: if it were not so, I would have told you. I go to prepare a place for you. 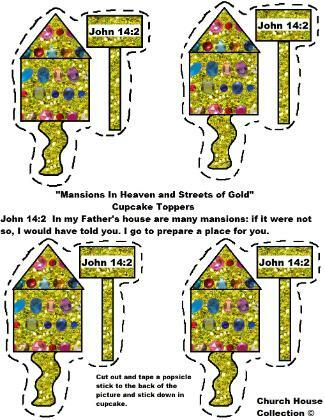 Print the colored mansion template out. This template has 4 mansions with it covered in jewels. It has a sign that has the words, "John 14:2" on the front of it. Just cut around the dotted lines to cut the mansion out. You could laminate these if you want to use these again later on down the road. Just tape a toothpick or a popsicle stick to the back of the picture. Then stick it down in the frosted cupcake. You could always use something fancier if you don't want just a plain popsicle stick. If you have colored popsicle sticks you try adding a peel and stick jewel to the front of the popsicle stick or a pretty gold ribbon to each one. You could try using pretty colored straws, food picks, or fancy crystal drink stirrers. Don't want to do all that? Too much work for you? Well, try this instead. Just bake some cupcakes and and add yellow frosting on top for the streets of gold and then stick one jewel ring pop down in the frosting. You could even find jewel candy in some stores or online and sprinkles those on top instead of using the ring pop. Or you could buy some dum dum pops and stick one of those down in the cupcake for the jewel. If you have edible pearls you could sprinkle those on the top for a pretty look. Or just bake some yellow cupcakes and add yellow frosting to the top. Then sprinkle gold dust on top for some pretty shine. The possibilities are endless.